Industrial Rope Access is a proven method of achieving a safe work position at height or in areas of difficult access. It was initially developed from techniques used in caving to answer the need for a simple, safe and adaptable means of access with its first large scale use being for inspections on the oil and gas platforms of the North Sea. As its value as a work solution grew rope access has also developed onshore where it is to be seen undertaking all manner of work from high-rise window and facade cleaning and general maintenance to repair, geotechnical and inspection work on some of the world’s most iconic structures. Rope access is safe. 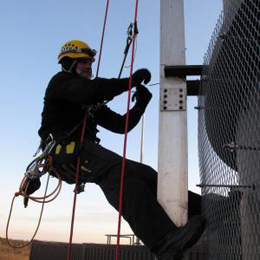 Independently-certified rope-access technicians uphold an enviable safety record with no fatalities and few lost time incidents while working on rope. Rope access is versatile. Technicians can apply the techniques in a wide variety of environments, from confined-space penstocks to massive concrete structures to complicated steel installations. 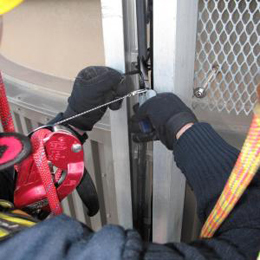 Unlike traditional access methods, custom rope-access solutions can be designed to fit various applications quickly and inexpensively. Rope access is efficient. Systems are installed and dismantled quickly and often require fewer personnel than traditional access methods. Rapid deployment limits disruption to facility operations by minimizing downtime. Rope access is economical. Fewer personnel, faster completion, less equipment, and minimal downtime mean lower costs.